Well, this is a sad post for me, as it is my last Challenge on the Design Team of JUST ADD INK. I have had a fabulous time being part of this wonderful group of very talented girls and I will miss it very much. So it seems fitting to end my last challenge CASEing the very talented KATHY TANNER. Pop over to Kathy's blog, choose a design you love and recreate or put your own spin on it. I love how this card turned out! You can see Kathy's original card HERE. I have used the same technique as Kathy, but have used a narrower mat behind the image, flipped the ribbon treatment and used a HUGE button for effect! I had a wonderful time putting this together - and isn't that what it is all about?!! The team have come up with some gorgeous recreations of Kathy's work, so be sure to pop over to JUST ADD INK and join in the fun this week! NOW, THIS IS MORE LIKE IT!! After my disastrous day in the craft room the other day (see post HERE), I have finally been able to turn out something I am proud of! I had to go back to my trusty sponges to get the look I was after though. My brayer is back in the box for the moment! Now I feel better. My creativity had taken a major hike, but I have a feeling it may be coming back - WHEW! I have even managed a couple more cards, slightly different from my usual style. Check back again later to see them! ONE OF THOSE DAYS - ARGHHHH! I was feeling inspired this morning to get in my craft room and make cards - I don't feel inspired now!! How can things go so badly wrong?!! If you have had one of these days - read on for a laugh at my expense! Not at all what I had in mind, but at least it didn't end up in the bin!! I am going out for coffee now. The craft room is closed! Yesterday I finally managed to have a play in my craft room! It has been a long time since I have been able to tinker around just for me. I decided to enter a challenge with Stampin! Up's Founder and CEO, Shelli Gardener, who is taking things back to simple with a challenge called Simply Stunning Creative Challenge. This card is simple! With only a couple of mats and a Basic Pearl for embellishment, the rest is all stamped. I used a clear block to create the textured background, and my one of my (many!) favourite stamp sets "My Friend". This card was another made in under ten minutes! In celebration of 100 challenges, JUST ADD INK have got a Blog Hop for you this Week! If you have already started the hop, you will have arrived here from the lovely Patrice Easton's gorgeous project at Spring Blossom Musings. Normally when celebrating a 100th Birthday, you would expect a message from the Queen. 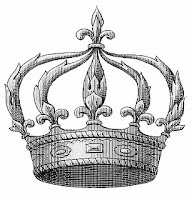 In keeping with that theme, the brief was to just add Crowns. There is a prize for commenting on all the Design Team member posts this week, and a prize for the winner of our Just Add Crowns Challenge. So please leave some comment love on your way around the Hop! I decided to try my hand at a View Master card. I kept the front of the card fairly simple, because the fun is in the "wheel" of cardstock peeking through the punched window. Simply spin the wheel and the image changes to a new one! How cool is that?!! I have also used Purple (Elegant Eggplant) and Gold for this card in keeping with the regal theme! I will be teaching this type of card to my Crafty Class Ladies at the end of this month. If you would like to join in and live local, then register for this class today! Please see my Class Page at the top of this blog. In the meantime, we are by no means done! The next stop is the wonderful Ruth Clarke, and boy, does she have a fabulous project to share with you! Simply click on the Crown to be taken to your next stop on the Hop! I decided to give my Craft space a New Year's clean up - you know -start as you mean to go on! I came across quite a few card samples from swaps, classes etc, that hadn't been completed or made up. It was amazing just how many I had and how much room they were taking up. So I made it my misson to sit down and actualy complete them. For some reason I had a lot of card bases in Riding Hood Red! I didn't necessarily complete the cards as they originally looked, but I did have a lot of fun playing around. This is another CAS card. I have actually used DSP!! Must do that more often, as it looks great as a mat. Some soft sponging to age it slightly, the addition of a bow and sentiment - COMPLETE! I am really enjoying cards that take 10 minutes or less to complete at the moment! Over at Just Add Ink, we are celebrating the New Year with a new monthly challenge - Just Add Scrapbooking. Join us on the first Sunday of each month for a new theme. This month, being the first ever challenge, what better theme than "Firsts" or "One (1)". Just add that anywhere on your title. Or perhaps this will inspire you to try your very first layout - that counts too!! I am a novice scrapbooker, but like to try to push myself, so these challenges will be a wonderful way to extend my knowledge. I hope you will feel inspired to have a go too! I chose to scrap this rather unique (in my family's tree, anyway!) event. My daughter was the very first girl to make her school's First Fifteen Rugby team. Man, did that raise a few eyebrows! And she was great! No fear of getting dirty and breaking a fingernail, lol. She certainly put some of the boys to shame too. To be truthful though, I haven't completely finished this layout. I love how it has come together so far, but need something a little extra in the top right hand corner to balance things out. I have a few ideas floating round in my head, but the great thing about scrapbooking is that you can come back to it later with a fresh eye. Good things take time! Now for more inspiration to help you start, pop by Just Add Ink to see the masters in action! Delys Cram and Ruth Clarke are working hard to bring you this fresh challenge each month. Their scrapbook pages are absolutely beautiful.